I was walking around this weekend and noticed a beautiful store window with gorgeous tissue pom poms hanging. I know it’s not a new idea, but they can really be beautiful. 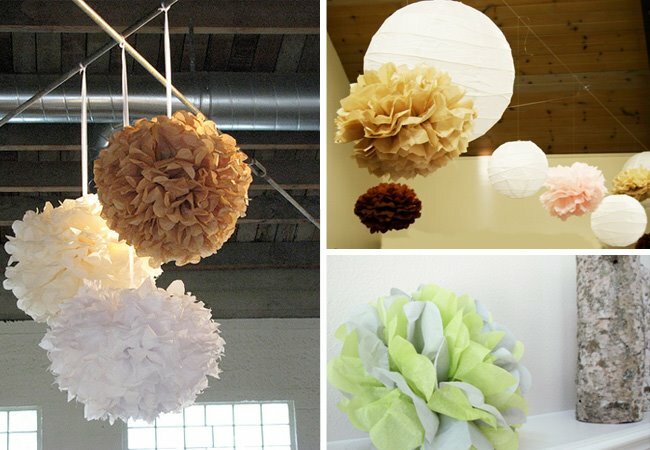 You can just hang them in different colors or mix with lanterns or just scatter them on tables. 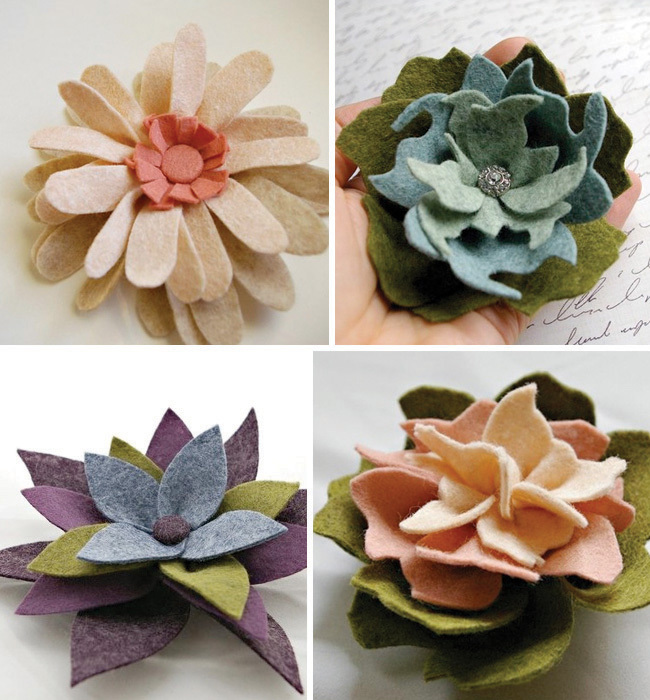 Martha has an easy tutorial on her site to make these. 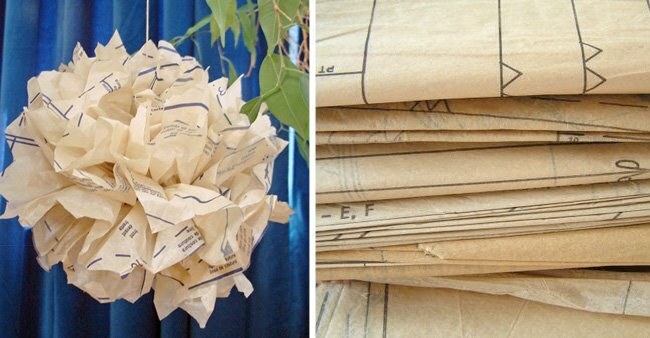 Anyone planning to make some for their wedding? If you don’t have time to make them, Pom Love on etsy sells them already made! A bit more expensive then if you make them yourself, but no work on your part :) These would be beautiful for a bridal shower also. Actually i made them for decor on our valentines bake goods sale and you can actually fold them and them puff them out when you need them and they still look pretty good. You just need to get the hang of how to fold them or flat them out. 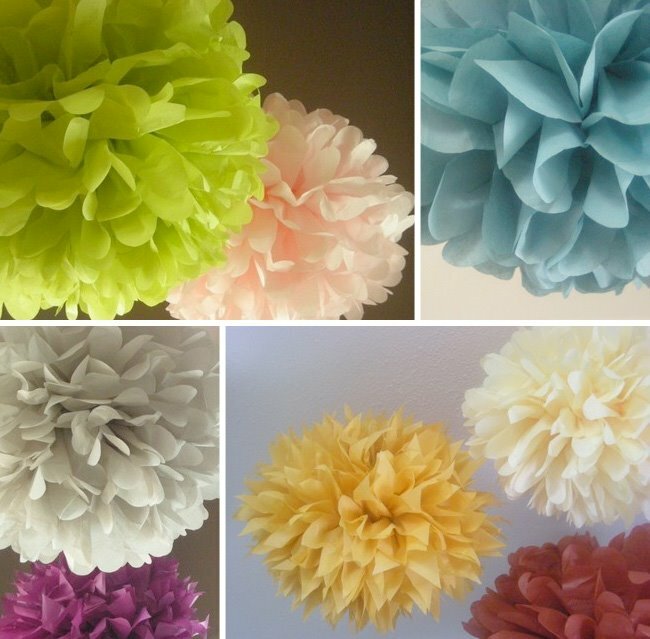 Gorgeous I love tissue pom pom.. 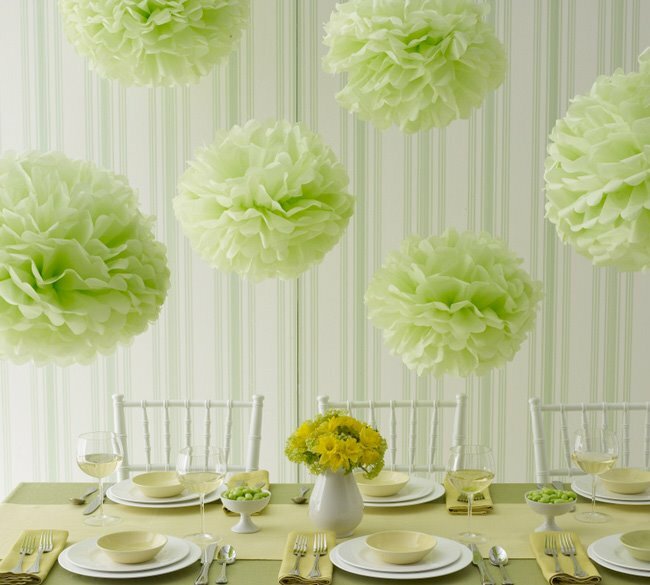 I saw the template and instruction for tissue pom pom in MarthaStewart website but not yet make one.. If I was doing this, I would wait until I got the location to “puff” the pom. Transport them un-puffed to prevent getting smashed, otherwise, you are right, probably will get smashed and not so cute. A.Mountain.Bride – nice collection of images also! thanks. I made one just to see, and it’s SUPER easy.. just fan folding really. The only tricky part was that my scissors are REALLY dull, so it was a challenge to cut through all that tissue. But I have a (hopefully) sharper pair that I’m going to use to make the wedding ones. Good idea on not poofing them out until at the venue.. I didn’t think of that! 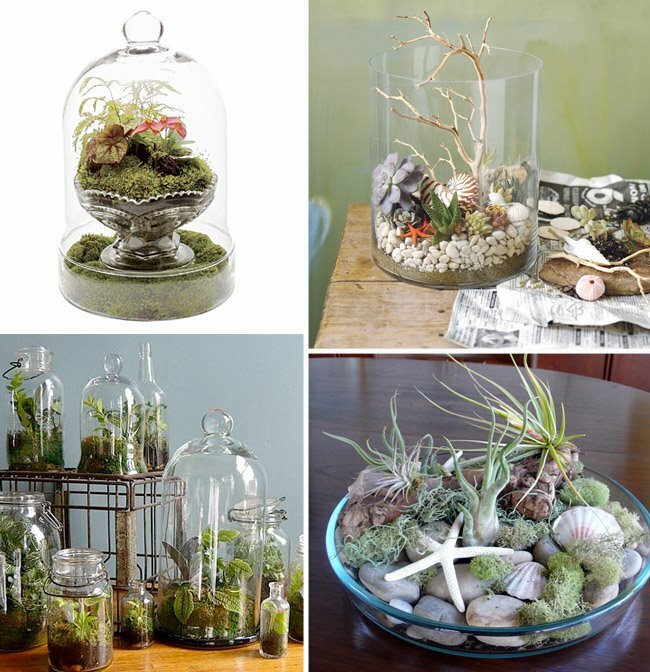 I want to see these used with dalia centerpieces! I used these (exactly that pale green above and white) for my shower and will use them again hanging from trees at the reception. They look so lovely and I received many compliments. these are so fun! how cute. I think I’ll use these on the “gift” table so it’s not so plain. I made a few different sizes and they are pretty cute. I agree that you should fan them at the location. I made these for practice. You can use just a regular twist tie instead of floral wire if you have that. Same idea. Hmmm…. These have a striking resemblance to my bath sponge. Not so crazy about this look. I am making pennant banners with our initials silkscreened on triangles of cloth, attached to lengths of clothesline to tie between trees at my outdoor wedding. Wow, I love these! I want dahlias for my May wedding but they’re not in season in MN yet, so I may end up with something else. These are a similar look, and sound pretty easy to make. Thanks for the tip. Wow, I love these. And they look so easy to make. I might have dahlias at my May wedding, but they’re out of season in MN then, so I might find something else. I love the look though. They look great and they’re easy. My mom and I did some test ones the other day, she used to make them with her mom at the kindergarten she ran! Apparently the trick is to use a twist tie, it’s holds them tight and you can still easily move it around. I made these a couple of weeks ago for a baby shower, so fun! I was going to buy them from Pom love, but found out there are other sellers on etsy that are more affordable. It is just tissue paper, how come they are so expensive? I am on a budget!! Here's my use of them…I am making a whole heck of a lot of them in all colors for my wedding. They will hang through the walkway to the bathroom. Since it is at sunset, I will probably put a tiny led-light in the center of each one so they glow. As for the MN gal, since Dahlias are very seasonal, tempermental, and expensive, try various large mums for a similar effect. If you want more color Ranunculus might be a good idea too; although they are smaller. Another new and crafty idea for flowers is, dare I say it, Carnations. Clusters of carnations in varying shades of the same color are quite show stopping and usually illicit the question, "What flower is that?" And now, they naturally(not dyed) come in some simply amazing purples.